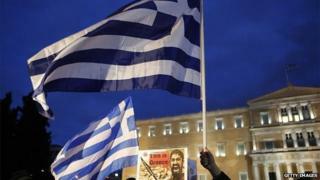 Germany has rejected a Greek request for a six-month extension to its eurozone loan programme. The rejection came despite the European Commission calling the Greek request "positive" only minutes earlier. Greece had sought a new six-month assistance package, rather than a renewal of the existing deal that comes with tough austerity conditions. However, a German finance ministry spokesman said the new plea was "not a substantial proposal for a solution". Later on Thursday, Greek prime minister Alexis Tsipras and German chancellor Angela Merkel spoke by telephone, according to the Reuters news agency. One Greek government official described the 50-minute call as "constructive", adding: "The conversation was held in a positive climate, geared towards finding a mutually beneficial solution for Greece and the eurozone." Meanwhile, Italian prime minister Matteo Renzi spoke to Mr Tsipras and European Commission President Jean-Claude Juncker in a further effort to strike a deal, an Italian government source said, according to Reuters. Greece formally requested a six-month extension to its eurozone loan agreement on Thursday, offering major concessions as it raced to avoid running out of cash within weeks, but the German finance ministry abruptly dismissed the proposal. The BBC's Mark Lowen in Athens says Germany's rejection of the Greek proposal suggested "a rift between Brussels and Berlin at the very highest level". "It's not yet clear which side will prevail, and which side will give ground, but clearly the hopes that Greece was moving towards a deal... have been thrown into doubt once again." BBC Europe editor Gavin Hewitt says the situation underlines the tension between Brussels and Berlin and mistrust between Berlin and Athens. A top European official said the stand-off had come down to a clash of personalities between German finance minister Wolfgang Schaeuble, who objected to the negotiating style of his Greek counterpart, Yanis Varoufakis. "There is a real problem of personalities and I understand that. Schaeuble is outraged by comments made by Varoufakis," the official said. The Greek request letter includes a pledge to maintain "fiscal balance" for a six-month period, while it negotiates with eurozone partners over long-term growth and debt reduction. The Greek government was also reported as saying that its extension proposal was in order to give Athens enough time, without the threat of "blackmail and time deficits", to draw up a new agreement with Europe for growth over the next four years. The German finance ministry spokesman said the Greek request was an attempt at "bridge financing, without meeting the requirements of the programme. The letter does not meet the criteria agreed upon in the Eurogroup on Monday." But shortly before the German rejection of the proposal, a European Commission spokesman said that Mr Juncker regarded the letter as a "positive sign, which, in his assessment, could pave the way for a reasonable compromise in the interest of the financial stability in the euro area as a whole". "The detailed assessment of the [Greek loan] letter and the response is now up to the Eurogroup," the spokesman added, referring to the discussions due to take place on Friday when European finance ministers meet in Brussels. In comments aimed at Germany, a Greek government source said the Eurogroup had "just two choices: to accept or reject the Greek request. We will now discover who wants to find a solution, and who does not". The main problem between Greece and Germany is an ideological one: Athens wants to stop saving and start spending to get out of the crisis. But Berlin believes that's exactly what caused the crisis in the first place, and remains convinced that the only path to long-term economic health is to make Greece more competitive. To make matters worse Berlin is clearly frustrated by Greece's negotiating tactics. Newspaper commentators accuse Athens of theatrical grandstanding - rather than constructively finding a compromise. And the occasional references to Nazis - such as a recent cartoon in a pro-Syriza newspaper depicting German Finance Minister Wolfgang Schaeuble in a Second World War German army uniform - have clearly not helped. In a radio interview Mr Schaeuble said he had a thick skin. But he also added that it's unwise to insult the people you're asking to help you. There is, however, also a lot of sympathy in Germany for the plight of Greek people. And an awareness of the importance of keeping Greece in the eurozone. But increasingly it seems, not at any price. Friday's vote on the Greek proposals must be unanimous. If no agreement appears likely before the ministers gather, the meeting could be postponed. The uncertainty was reflected on stock markets, with the FTSE 100 closing down 9 points, although Frankfurt's DAX index ended the day up 0.4%. The euro was down slightly against the dollar and sterling. Italian finance minister Pier Carlo Padoan warned on Thursday: "We have to send a signal that the euro is irreversible. If a country were to leave, it wouldn't just mean one less country in the union but the transformation of the euro into a mechanism that can be undone." Mirabaud Securities trader John Plassard said: "Investors think that even if a deal is reached, it won't mean that the 'Greek issue' will be resolved. There will be serious doubts on whether Greece will fully implement the agreement." Greece could run out of money by the end of the month without a deal and deposits continue to flow out of its banks. Popular tabloid Bild has a double-page spread featuring pictures of Vladimir Putin and Alexis Tsipras with the headline: "The Russian or the Greek: who is more dangerous for us?" Underneath it says: "Europe is in the most difficult crisis it's seen for decades -- because two heads of government are aggressively demonstrating their power." A commentary in Frankfurter Allgemeine Zeitung says: "The Greek government appears to believe it can treat its partners like fools," accusing the Greek government of using Brussels like a stage for theatrics, adding that many people have simply had enough. And the business paper Handelsblatt says the request for a loan extension changes very little. "It remains unclear whether Athens is willing to meet the conditions set by its creditors." And that, the paper says, is crucial for the meeting of European finance ministers on Friday. What will Germany pay for not compromising with Greece? Video How would a Greek exit work?